GLS 177 was designed by Bard and Fowler for us to experience the History of France by traveling through it!. 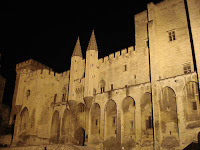 So we began in Avignon to visit and learn about Roman and Medieval France. Dr. Bard was the resource person for our stay in Avignon. In addition to Avignon we visited Arles, Nimes and Pont du Gard. 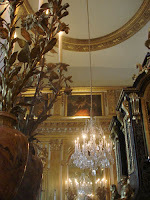 Then on to the Loire valley and Tours to learn about the beautiful French Renaissance chateaus and their gardens. Here Drs Bard & Fowler shared responsibility for the course materials and site visits. 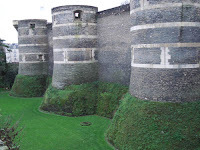 We visited Blois, Chenonceau and Angers. 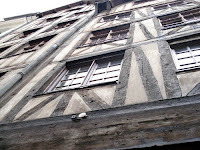 Finally to Paris to focus on the 17th century forward -- although we did spend some time with Medieval Paris. 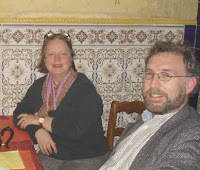 Again Drs Bard & Fowler shared responsibility, with the assistance of Dr. Fowler's friend and Paris guide, Michael Osman. 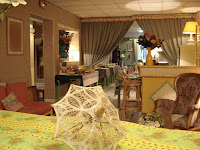 We stayed in simple, but well-located two star hotels in Avignon, Tours and Paris, and traveled via regular train and bus services. 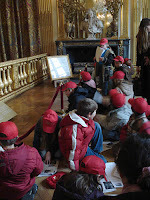 All transportation within France as well as all site admissions fees were included in the program fee for the trip. Planning has begun for the 2007 trip. So please enjoy our 2006 journey and consider joining us on the next one! 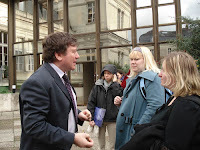 On November 27, 2006 a group of 21 students, faculty, staff from North Central College, plus one aunt, left from Chicago's O'Hare Airport to begin their Journey Through the History of France together. 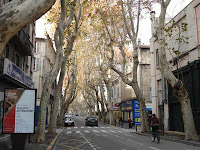 After changing planes and airports in Paris they arrived safely in Avignon the afternoon of November 28, where they were met by the 22nd group member, the author of this blog. 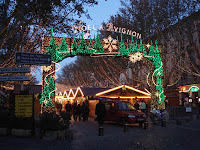 After our taxi "cavalcade" from the airport to the center of Avignon, we checked into our hotel, Hotel Danieli, which was right on the main street, rue de la République, and began to explore Avignon! Many of us saw the Palace of the Popes for the first time at night! 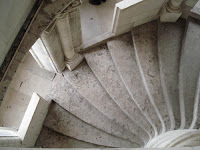 There was no rest for the weary as we started our site visits with a full day in Arles, just a short train ride away, but much like a time warp as we were taken back to Roman Arles from the 1st century B.C.E. We visited the Arena, the Theatre and the Roman Baths. 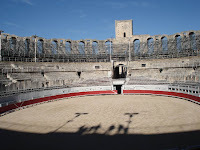 The arena is still in use today for bull-fights [no bull dies fortunately!] We clambered all over the sites with our worksheets in hand. We saw this sign for the bull lotto on the window of the small cafe where some of us ate a simple and inexpensive lunch -- sitting outside in the sun! A highlight for many of us was the Romanesque church St. Trophime and its cloister. The poor sinners on the right-hand side of the portal are in chains with flames licking at their feet! We began our next day in Avignon with a guided tour of the gothic Palais des Papes, built during the popes' exile from Italy in the 14th century. Laurence was our wonderful guide! 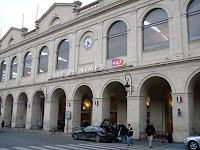 Then we dashed down rue de la République to catch the train to Nimes, a very modern city with some Roman sites worth seeing. 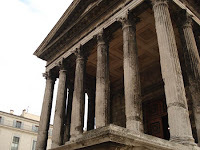 We saw our second Arena and then the temple, Maison Carré. 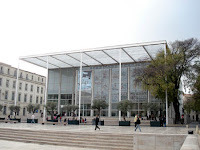 Unfortunately there wasn't enough time to visit the Carrée d'Art just opposite. 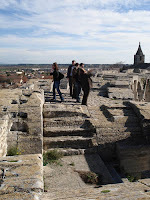 Unlike Arles, where the old houses had been built right up to the Roman ruins [including at one time IN the arena! 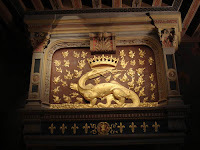 ], Nimes was a modern city graciously acknowledging her monuments. And so we went, back to the train station again! 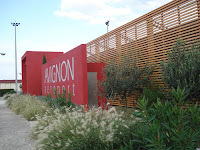 And home to Avignon. 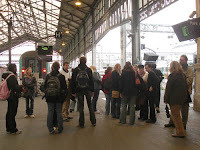 Our experiences with the French rail system were good ones with only a couple of minor glitches. We became pros at finding our train and settling in for our rides. We took the bus or "navette" from just inside the Avignon city walls to the TGV train station, just outside Avignon. These high-speed trains don't stop in the main train station. We were on our way from Provence to the Loire valley where we would spend 4 nights in Tours and visit 3 chateaus and their surroundings. When we arrived in Tours the southern sun had deserted us, but a walk around the walking streets and the city hall area showed us a city all decked out for the holiday season! 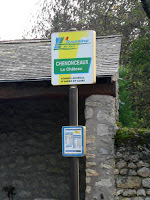 We took the bus ,or routier, to Chenonceau, which stops in the small town of Chenonceaux. 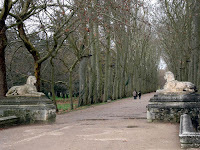 It is a short walk to the chateau grounds from there. This was almost everyone's favorite chateau in the Loire. While it rained intermittently [more of a drizzle really], there were periods of sun and time to explore the gardens as well as the chateau itself. 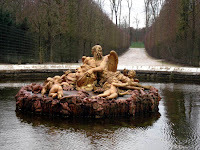 The video clip below is of Diane de Poitier's garden and the chateau. The chateau bridges the Cher river thanks to the two strong women who ruled here during the 16th century, Diane de Poitiers and Catherine di Medici, Henri II's mistress and wife respectively. 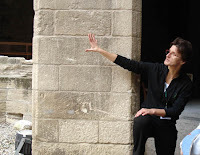 Diane built the bridge and Catherine constructed the grand hall that we see today. Inside the chateau you can see their bedrooms. 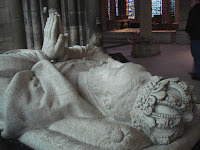 Pictured is that of Diane de Poitiers, the mistress of the king. 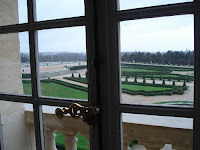 Dr. Bard provided the background for the chateau itself, while Dr. Fowler took on the gardens. 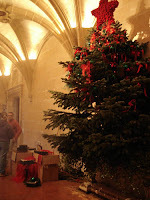 The chateau staff was beginning to decorate for Christmas and there were some fires in the fireplaces, making Chenonceau's welcome even warmer! Almost everyone made it into the lower levels where the kitchens were located. We were wondering who keeps all those copper pans polished! 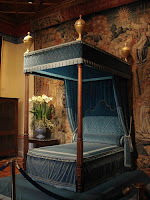 We didn't want to leave Chenonceau! But it was time to walk between the sphinxes that guard her, down the allée lined with plane trees and back to the bus stop. We had a full day planned for Angers as our exchange program in French is with l'Université Catholique de l'Ouest based in Angers. We began with a longish walk from the train to the university where we met with the person in charge of the international students program. We also were able to spend time with a North Central student who was studying at UCO that term. After our campus visit we broke for lunch on our own and regrouped at the cathedral. 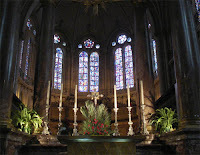 Many students were seeing their first real gothic cathedral and found the experience of being in that space spiritually moving. By now the storm that would dog us for the next couple of days was moving in. We managed a good visit to the chateau, even walking on the battlements, before we threw in the towel [or our turned inside-out umbrellas] and trained it back to Tours. 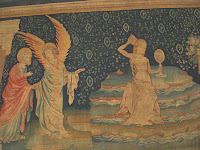 A highlight for many of us were the famous Apocalypse Tapestries made in the 12th century and based on the Book of Revelations. The exhibit space was excellent and well worth the time we spent there. 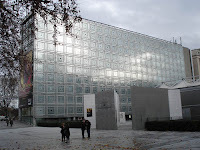 We did miss visiting the Jean Lurçat museum across the river, but we WILL get there in 2007! 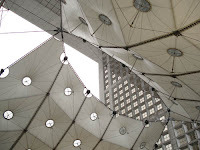 We left Tours for Paris fairly early to give us a chance to see a bit of tourist Paris before we began our site visits. By now we were more self-sufficient, so we dispersed widely, with many ending up at the Eiffel Tower at dusk just as the lights began to sparkle! 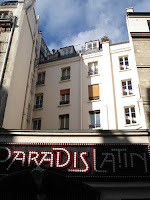 Our hotel was in the 11th arrondissement near Place de la Bastille. 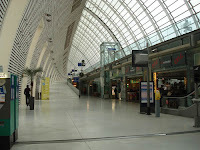 Several metro lines converged at that station, making it a good base for our explorations. There were plenty of good places to eat in the area between our hotel and metro station, [including tex-mex !] and interesting small streets to explore. There was also a convenient cybercafé, food stores and a laundromat close by. 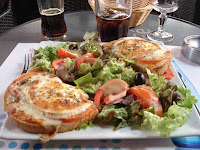 We divided our first full day in Paris between Revolutionary Paris and the medieval area in the Marais. 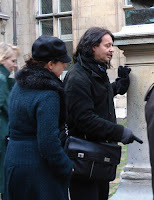 Dr. Bard led the Revolutionary charge, while Dr. Fowler and Michael Osman unraveled the mysteries of the Marais for us. 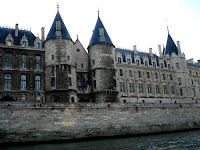 The Revolutionary tour included the Conciergerie Museum on Ile de la Cité. Originally built as a royal palace, it became a prison in 1391. 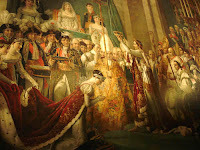 During the French Revolutionary period, almost 3,000 men and women were sentenced and detained there until their death by guillotine at the center of Place de la Concorde. 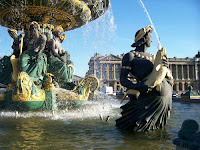 Place de la Concorde's current name belies its bloody history as the site of the guillotine. Constructed in the 18th century, It was first called Place Louis XV and then Place de la Révolution, finally changing to its present name. 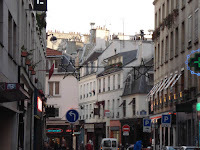 We visited the Marais to learn about city life in the medieval era. We were also visiting "our" house, that we had read about in Alex Karmel's "A Corner in the Marais" and learning about the construction of medieval houses. But, of course, there was time for window shopping -- we found these pistachio flavored "mice" cookies rather charming.